The Design Team of FirefighterPrep has been recognized by quality educational institutions as a leader in Recruitment Training. Our online testing platform is used to help students in Police Foundation and Criminal Justice programs to prepare for the challenges of the police Recruitment Process. Partnering with FirefighterPrep provides Colleges with a highly customizable and co-branded online training website. We provide detailed electronic test results that allow College professors to easily evaluate student performance. With a co-branded website, students maintain their association to the College both in class and on the internet. FirefighterPrep provides all partner Colleges the ability to provide career preparation for students even after graduation. Our College packages are structured to provide students with mulit-year access to our online training program. 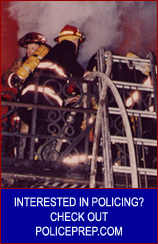 Students may continue to use FirefighterPrep after graduation to prepare for the recruitment process.